Rahul Gandhi alleged that the Modi government tried to murder the Land Acquisition Act, which benefits the farmers. BARAN: Questioning Prime Minister Narendra Modi over his assurance to people that problems due to demonetisation will end after December 30, Rahul Gandhi today said the "economic lockdown" will continue to hurt the poor, farmers and workers the most. "Modiji has said that the problems will end after December 30. But I can say with confidence that it will not be so. These hardships will continue for six-seven months and beyond," the Congress Vice President said addressing a rally here. He was referring to the Prime Minister's repeated assurance to the people that the problems due to note ban will begin to ease after the 50-day period. Persisting with his attack on the demonetization issue, Gandhi alleged that the Modi Government at the centre and Vasundhara Raje government in Rajasthan had not taken a single step for the poor. "The note ban decision is not against corruption but is an economic lockdown. It is not against blackmoney but against the poor, farmers, labourers and women," he alleged. "99 per cent of the people do not have black money and they were targeted by the demonetisation drive while on the other hand, there are 50 families who have lakhs and crores of rupees and that is black money," he said. Stating that the Congress party wants to eradicate corruption and its leaders would support the NDA government against the menace, Gandhi alleged that the decision of demonetisation was "totally against the people of the country". He said that only six per cent black money is stored in cash while the remaining is in the form or real estate and gold and is also stashed in Swiss bank accounts. "In the last two-and-a-half years, Modi only worked to create a divide in the country and functioned only for the rich," he alleged. 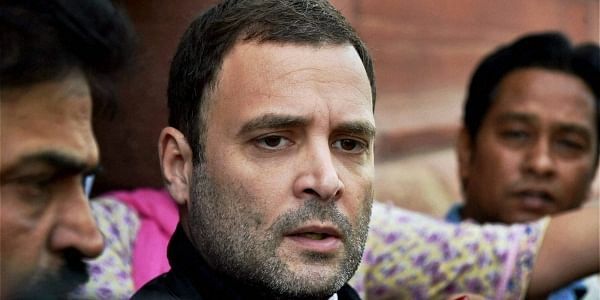 Rahul alleged that the Modi government tried to "murder" the Land Acquisition Act, which benefits the farmers, and also attempted to stall other pro-poor steps like MNREGA started by the Congress. He alleged that the BJP governments have failed to fulfill three demands of the farmers, namely debt waiver, lower power tariff and proper price for their produce. He also alleged that the tribals were being exploited in BJP-ruled states of Madhya Pradesh, Chhattisgarh and Jharkhand. "The entire government is functioning of the rich. What Narendra Modi ji is doing at the Centre, the same is being done by the chief minister of Rajasthan. "In Rajasthan, privatisation is going on. Power tariff was raised by 18 per cent. Have Modiji and the BJP government here taken any step for the poor. They have done nothing for the poor," he said.